For office workers concerned about cutting costs and environmental impacts, clicking the print button triggers an ongoing internal debate. Many people find reading words on a printed page to be a hard habit to break when the only alternative is reading them on glowing screen. But given that up to 40 percent of office documents are printed for one-time use, the desire to take in paper-based words versus ink's relatively high cost and the waste that is generated is an area ripe for change. Chinese researchers say they may have come up with just the thing to ease the conscience and lower the cost of reading documents on paper. They've created a jet printer that uses water instead of ink and a complimentary reusable paper that changes color while it's moist. "We all know we are facing many problems. Three major problems are the energy crisis, global warming and ecological and environmental deterioration," says Sean Zhang, a Jilin University chemistry professor and coauthor of a study on the innovation published in the journal Nature Communications on January 28. "All of these three problems are caused by one main factor: deforestation. Excess paper consumption contributes greatly to deforestation." According to the U.S. Environmental Protection Agency, Americans alone generated more than 70 million tons of paper and paperboard trash in 2011. Total world consumption of paper amounted to 400 million metric tons in 2012, the Swedish Forest Industries Federation estimates. Zhang says his team has taken a step toward decreasing paper consumption with the water-jet rewriteable paper because it can be printed on and erased a number of times. The paper is made with dyes that are invisible when dry but reveal colors when wet. Water acts as a key for the dye, opening up closed and colorless molecules when it is present to trigger coloration. Jilin University scientists demonstrate their water-jet printer paper after it printing in a converted conventional printer. Courtesy Sean Zhang/Jilin University/Nature. Their tests have shown each sheet can be reused at least 50 times. 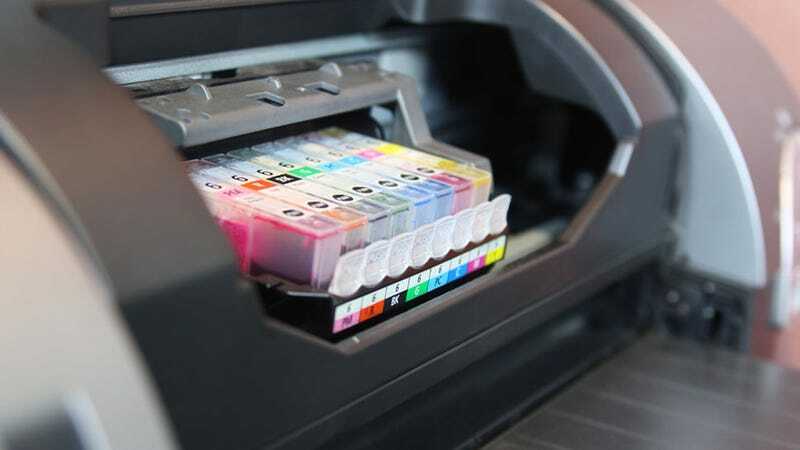 They used a standard desktop printer whose ink cartridge had been refilled with plain water. They also demonstrated the paper's abilities with a water-filled pen, which temporarily records handwriting in the same way. "So far, we've already achieved four different colors and the prints can last for 22 hours," he says. "The quality of the water-jet printing is comparable with ink-jet printing." In the paper, the authors say they hope to work on improvements. "The legibility and resolution of our current water-jet prints seem good enough for general reading purpose, and we are conﬁdent to improve further the color intensity and evenness of our rewritable media," they write. Jilin University doctoral student Lan Sheng demonstrates water-responsive rewritable paper with a water-filled pen. Courtesy Jilin University/Nature. Because the paper is reusable and water is significantly cheaper than ink, the researchers say water-jet prints should be one percent of the cost of ink prints per page. They've run initial safety tests on the water-reactive dyes and found them to be in the low toxicity range. Extended exposure tests with mice are now underway. "Even though we are in the electronics stage… people prefer hard-copy reading," Zhang says. With the water-based printing system, "we are not only saving a lot of money, we also solve the problem of paper waste. This post originally published on Txchnologist. Txchnologist is a digital magazine presented by GE that explores the wider world of science, technology and innovation.